TEAM RCP joined a record-breaking crowd of 7,500 plungers at the 26th Annual Polar Bear Plunge in Seaside Heights on February 23rd. The event raised over $2.3M to benefit the Special Olympics of New Jersey. 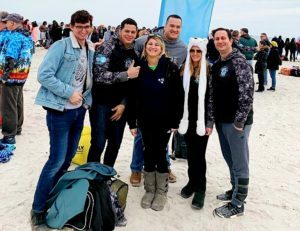 RCP’s awesome Polar Bear team this year included employees and members from The Accent Group, The Falcon Group & C&L Services. “Hands of Hope” is a group of RCP employees who volunteer their time and talents to support charitable causes and events in our community. We are excited to announce that RCP Management Company will be moving our corporate headquarters to a new, modern, high-tech facility right around the corner in Cranbury, NJ! 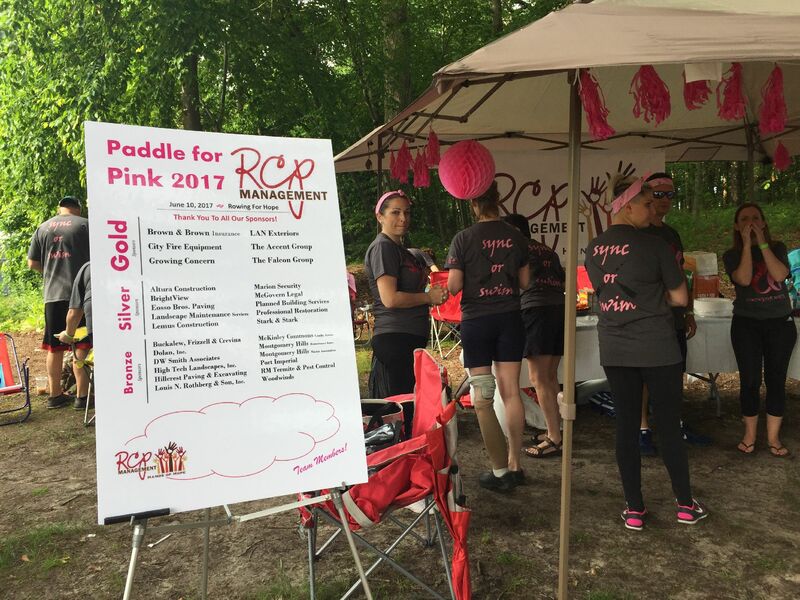 RCP would like to invite you to join us in celebrating the 12th Annual Paddle for Pink Dragon Boat Festival, Saturday, June 9th at Mercer County Park in West Windsor, NJ! RCP Management Company’s team Rowing for Hope is returning for gold! That’s right; we’re paddling to raise awareness and support for the women and families who have been affected by breast cancer in our community. 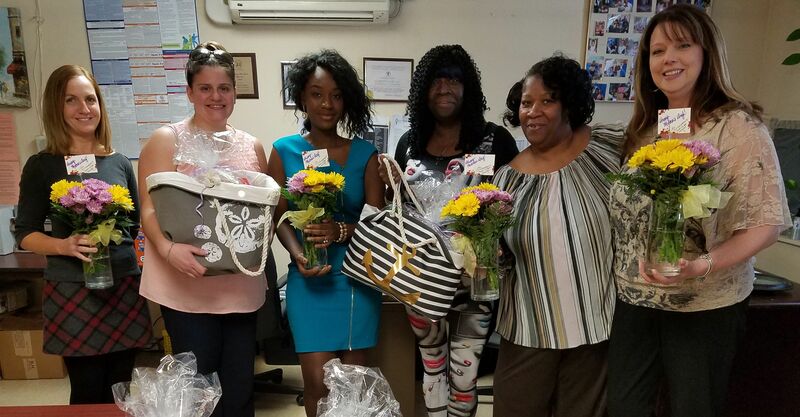 Over $85,000 has been donated to support free services provided by the Breast Cancer Research Center (BCRC) of the Princeton Young Women’s Christian Association (YWCA) and fund breast cancer research by the Cancer Institute of New Jersey (CINJ). 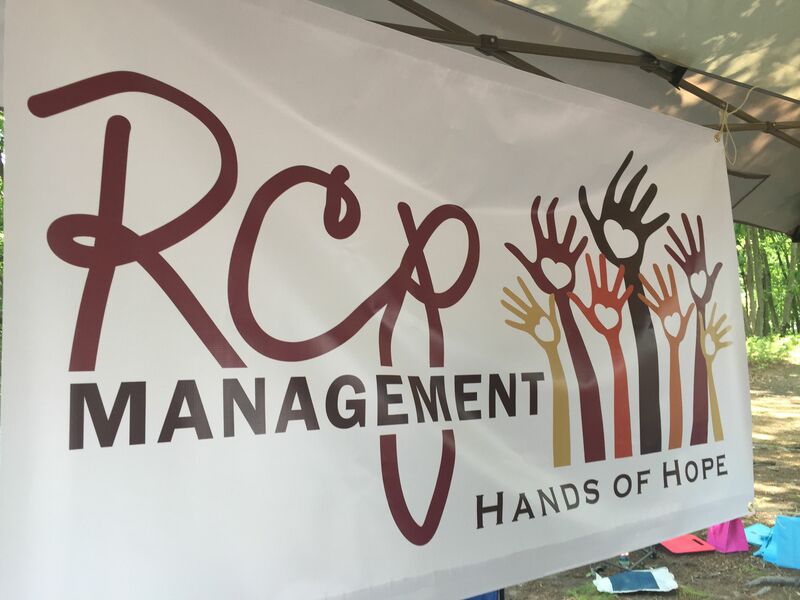 “Hands of Hope” RCP Management’s Charity Committee is excited to assemble a great team of employees, family, friends and vendors to bring home the gold and we want you to experience the excitement with us! Special thanks to our sponsors for supporting this great event! Paddle for Pink Sponsors 2018! 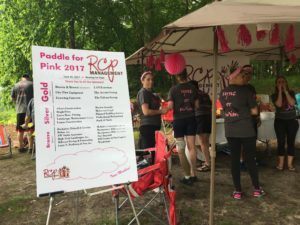 RCP’s Charity Committee Hands of Hope is proud to support Paddle for Pink! 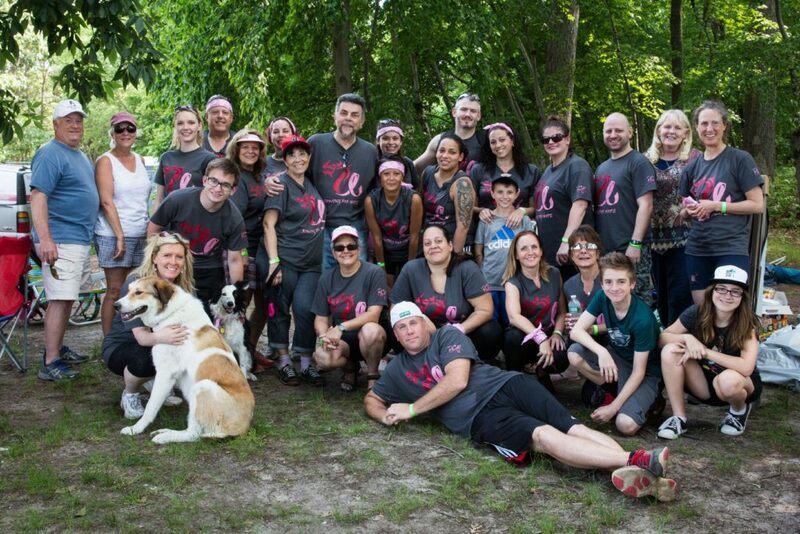 Saturday at the 11th Annual Paddle for Pink Dragon Boat Festival! Join us again next year, 2018! RCP Management’s team Rowing for Hope is excited to announce this year’s generous sponsors so far! We appreciate the vendors, professionals and clients partnering with us for the 11th Annual Paddle for Pink Dragon Boat Festival! Rowing for Hope is returning for gold in the 11th Annual Paddle for Pink Dragon Boat Festival on Saturday, June 10th at Mercer County Park! Join our team, or become a sponsor, or visit our RCP tent and enjoy the food & fun! RCP’s Charity Committee “Hands of Hope” is proud to partner with St. Rocco’s Family Shelter in Newark. 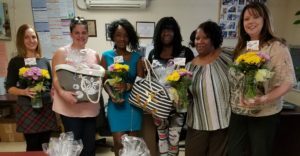 Hands of Hope hosted a Desserts and Donations event at our corporate office in Monroe and delivered the donations along with flowers and cupcakes for the moms at St. Roccos! 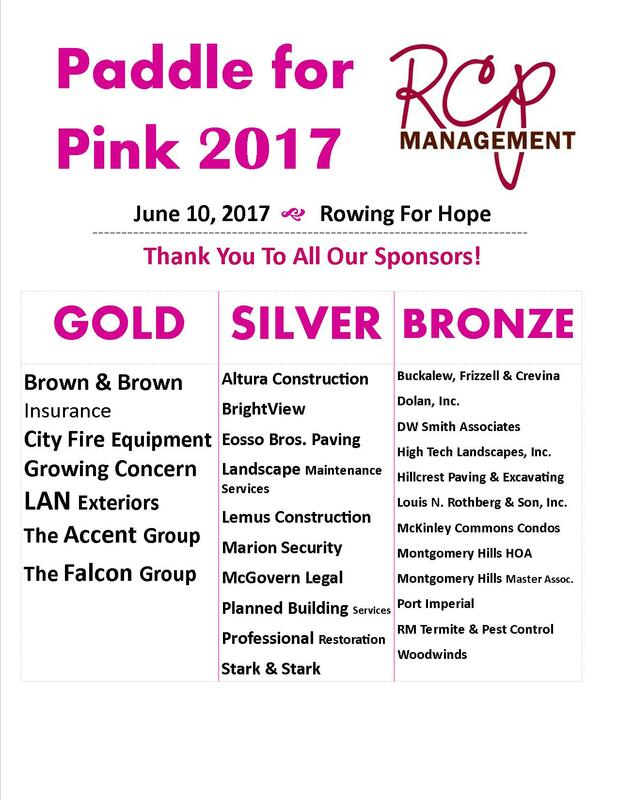 RCP Management Company’s team Rowing for Hope is returning for gold in the 11th Annual Paddle for Pink Dragon Boat Festival on Saturday, June 10th at Mercer County Park! 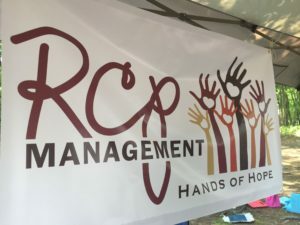 “Hands of Hope” RCP Management’s Charity Committee is excited to assemble a great team of employees, family, friends and vendors to bring home the gold and we want you to experience the excitement with us! We paddle to raise awareness of breast cancer and support the women and families who have been affected in our community. Over $85,000 has been donated to support free services provided by the Breast Cancer Research Center (BCRC) of the Princeton Young Women’s Christian Association (YWCA) and fund breast cancer research by the Cancer Institute of New Jersey (CINJ). If you would like to be a Sponsor for this exciting event, contact Jessica at jricevuto@rcpmanagement.com. If you would like to join the team and paddle please contact Kristina at kmunson@rcpmanagement.com. Sign up today! We would love for you to be on our team!